Webster’s Dictionary offers a very succinct definition of “stereotype.” It reads: 1. to make a stereotype from a.) to repeat without a variation b.) to develop a mental stereotype about. Loaded with meaning and consequence, “negative” is frequently paired as a prefix. Stereotypes are rarely considered positive. Webster’s has gotten it right, particularly as stereotypical representations flourish in visual culture – in works of art – and in particular in cartoon caricatures. To stereotype an individual is to strip them of their unique qualities, rendering them as one-dimensional figures with a singular behavior, dress, or unifying physical trait. Stereotypes strip away diversity. It denies a unique individual personality. A stereotype creates the suggestion that the subject or person only dresses, eats, talks or behaves in one limited way. To perpetuate a stereotype is to repeat that suggestion verbally, mentally, and visually. Through repetition, the stereotype gains a strange form of legitimacy that is difficult to unravel and reverse. Editorial art historian Donald Dewey feels that American caricature’s “sorry history” need not have been inevitable. However “the pandering of artists to the opinion of readers was certainly a very large lure” (25-26). Dewey takes little credit away from Nast’s talents, but argues that a great portion of his art succeeded because it responded to people’s own “preconceptions about the last word in viciousness and degeneracy.” Repetition of images “tickled readers’ assumptions” (27). Dewey calls visual symbols “an economic language in a frontier society where literacy wasn’t always available currency” (11). A weekly deadline didn’t provide artists with the luxury of time to deliver nuanced images. Like many cartoonists, Nast had a sketchbook of references, a repertoire of stock images that he could utilize and quickly drop into place as an ingredient to a scene. Nast’s home studio in Morristown, New Jersey was filled with objects; vases, weapons, classical works of art and likenesses which served as prop models. In the flurry of the Tweed years, Nast contributed as many as seven images over two issues. Meeting deadlines with a respectable level of detail required artists to take short cuts by repeating visual symbols. John Kuo Wei Tchen believes that when it came to China, the American representation of Chinese people and wares changed drastically from 1776 to 1882. During the early part of this era using “Chinese things, ideas and people in the United States, in various imagined and real forms, has been instrumental in forming this nation’s cultural identity” (xv). Tchen explains by the end of this period, as the U.S. approached the turn of the century, the rank and file American saw the Chinese as interfering with America’s “Manifest Destiny.” Chinese American men posed a direct threat to Caucasian laborers. Competition for labor to build America’s railroad infrastructure shifted to white labor. To facilitate this change in attitude, it was important to point out the differences and the dangers of Chinese people living and working in America. Each time real Chinese were mimicked, simulated, and reproduced … abruptly altered, reduced and/or simplified. Visual images abstracted from real people were also disengaged from the real complexities of their lives, from the layered, creolized cultural practices of Chinese New Yorkers. The resulting abstractions – narrow racialized types-were easily recognizable and therefore highly salable…Such images, however, had a powerful effect on the real, everyday options of real, everyday Chinese, the representations became the real thing. (125). Tchen’s definition of stereotype and its effects is an excellent one. Complexities become simplified. Easy representations become the truth. And particularly with the second half of the nineteenth century cartoons on Chinese immigrants depict Chinese as males wearing their native dress and the long queue hairstyle. Many American cartoonists elongated Chinese heads and exaggerated the slants of their eyes. The most negative Chinese stereotypes include the addition of rats as companions and a staple of the Chinese diet. Smoking opium and living in squalor are common stereotypes. Since labor issues surrounded the presence of the Chinese, they are often shown working as launderers, cigar makers, shoe cobblers, tea merchants, miners or railroad workers. Chinese American men are rarely shown with Chinese wives, which was indeed rare. Chinese men and never shown to wear western clothes – a confirmation of their refusal to assimilate. In cartoons, particularly on the West Coast, it was common to show the Chinese as members of invading hordes, vectors of malaise and disease. Stereotypes exist in all forms of communication – on stage, television, film, music, in casual conversations and through the use of expression in high and low art. Dehumanization is a technique which intentionally depicts a human being as anything other than a human. Representation of an individual or groups of similar individuals with animal or bestial characteristics turns a dignified human being or members of a race, into an “other.” Representation as inanimate objects (see Magnetic Blaine) also dehumanizes and converts a person into a material item or gadget, and therefore easily discarded or diminished. When humans are classified and conceptualized as lesser “others,” superior humans feel entitled to rule, dominate, judge and punish “others” without guilt. 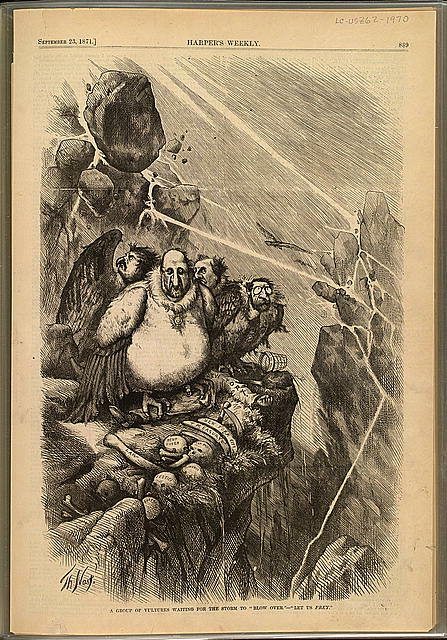 For example, Nast depicted Tweed as a vulture, an unattractive and corpulent version of the predator. He reduced Catholic bishops to a swarm of crocodiles in “American Rivers Ganges.” Taking cues from English artists he admired, Nast and other cartoonists frequently depicted Irish Americans as apes. George Frederick Keller would depict the Chinese on the West Coast as invading forces of locusts or hordes of pigs. They were also depicted as cephalopods or octopuses. “Octopuses had long been the icons of the top-down authoritarian power in Europe. In industrializing America,however, a revolutionary nation that imagined itself free of corruption of Europe also became entangled in monopolies controlling previously unimagined wealth and power” (Tchen/Yates 4-5). 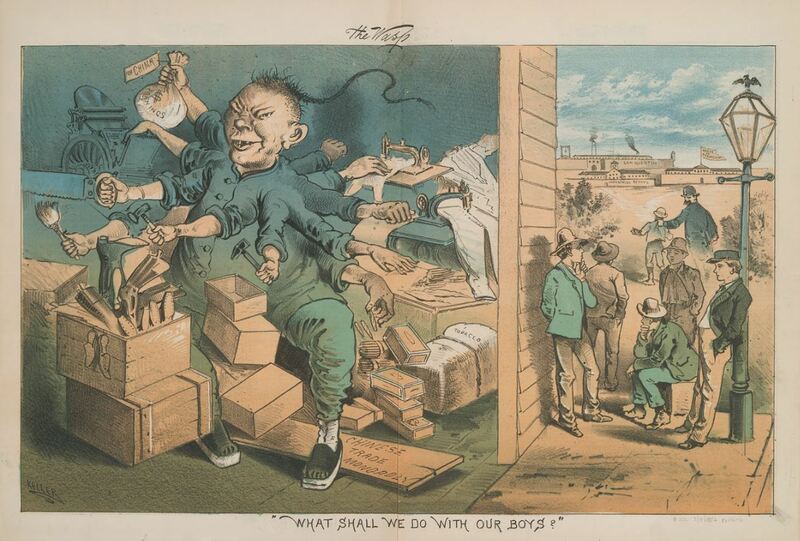 See “What Shall We Do With Our Boys” to see a Chinese worker drawn as an octopus, monopolizing labor. 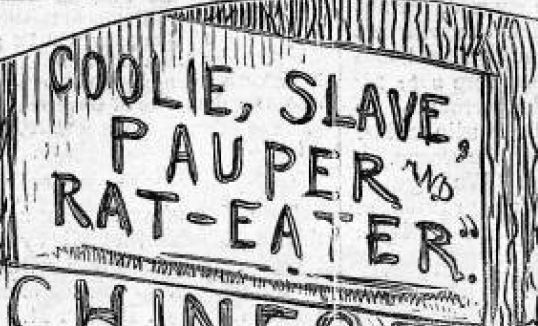 Dehumanization may assign unpleasant behavioral traits onto a race or ethnic group, e.g., Chinese as rat eaters. With the arrival of Darwin’s evolutionary theories, many Anglo-centric populations in Europe and America were willing to incorporate the theories as justification to define African Americans or Irish Americans, and later the Chinese, as sub-strata human beings, or as occupiers of a lower rung on the evolutionary ladder. Dehumanization also occurs through language to define and reduce individuals in simplistic derogatory terms e.g., “gooks,” “mics,” “spics,” “kikes,” “niggers,” “chinks.” Therefore, through word and or image dehumanizing an individual or group of people reinforces the mindset of the oppressor a justification for their prejudice.